Ohio is suing the company building a $4.2 billion natural gas pipeline from West Virginia to Michigan over what it says are numerous water pollution violations during construction. 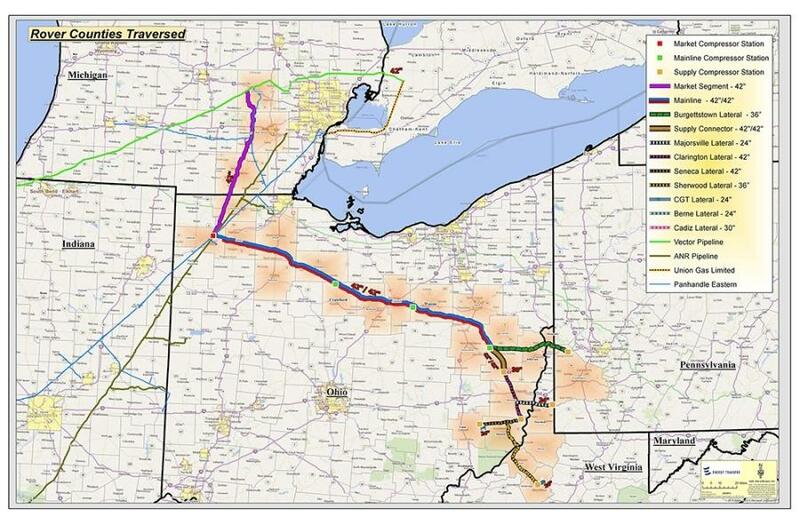 The lawsuit filed said work on the Rover Pipeline flooded a protected wetland with drilling mud and has damaged the environment in more than 10 of the 18 Ohio counties where the pipeline is being built. It also said that Rover Pipeline LLC had violated state laws, rules and permits designed to protect water quality. The twin pipelines are being built across Ohio to carry natural gas from Appalachian shale fields to Canada and states in the Midwest and the South. Much of the 700-mi. pipeline is being built across Ohio and will extend into Michigan, Pennsylvania and West Virginia. The head of Ohio's EPA, though, has said several times that the company has been difficult to deal with and unwilling to negotiate a settlement. Ohio's environmental regulators and landowners have said that soon after construction began in March, there were problems with crews spilling drilling mud into wetlands, ponds and streams and pumping storm water into streams and fields. The state EPA in September said the amount of fines against Rover had risen to $2.3 million. Energy Transfer Partners responded by saying it will continue to work with the Federal Energy Regulatory Commission to meet its requirements. The state's lawsuit filed by Attorney General Mike DeWine seeks to force the company to pay civil penalties of $10,000 per day for each violation. The developer, the Ohio EPA said, has complied with orders to begin plans to clean up and restore wetlands that were coated with drilling mud, remove mud contaminated with diesel fuel from two quarries and monitor water wells near those sites. But the agency said the company has refused the state's directive to obtain storm water pollution permits.